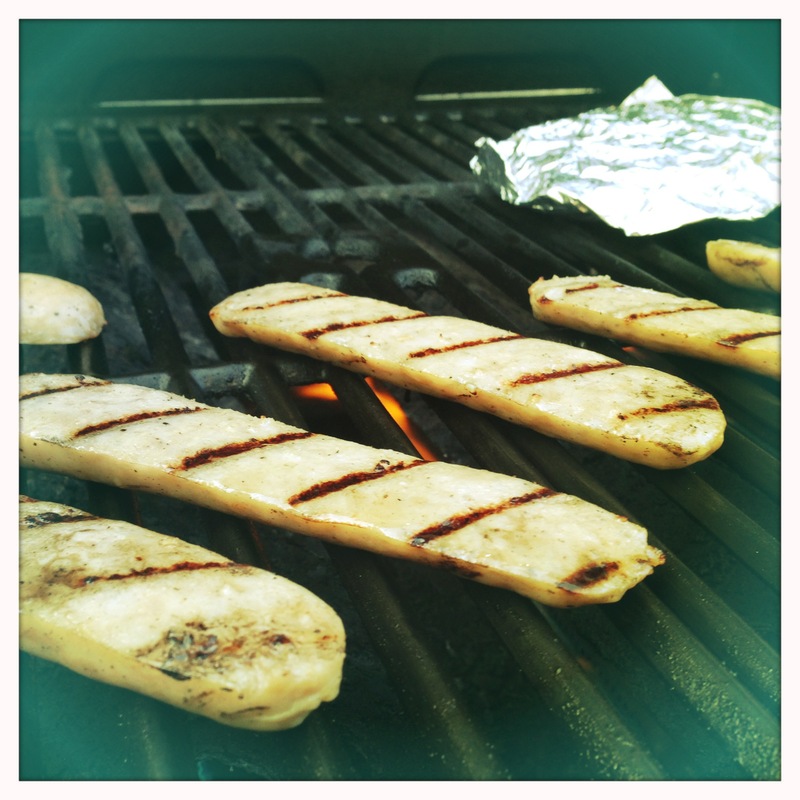 This is one of my favorite quick meals on the grill. It uses pre-cooked stadium style brats sliced in half before grilling to reduce cooking time (and increase grill marks for more grilled-on deliciousness). This is a great meal to make on a warm evening when time is short. Considering how much my posting has fallen off lately, clearly time has been a rare commodity for me lately, so I’m sharing a meal I’ve been using to keep all the hungry eaters at Eats For All Ages happy while saving time as well. Preheat your grill to a medium heat. While the grill is preheating, slice the onion and place in a foil packet with a little salt, pepper and olive oil. Shake to evenly distribute oil and seasoning. (More detail on foil grill packets can be found here.) Slice the brats in half lengthwise. Place the onions on the grill for about 5 minutes, then flip. Place the brats on the grill, sliced side down. Cook for about 5 minutes, then flip the brats and flip the onions again. The brats are already cooked, so continue to grill until you have reached your desired level of grill marks and browning. Flip the onions periodically, cooking for about 15 minutes total. Place the brats onto the buns. Top with the grilled onions, kraut and dusseldorf mustard. You can obviously use the toppings of your choice, but this combination is traditional and delicious. 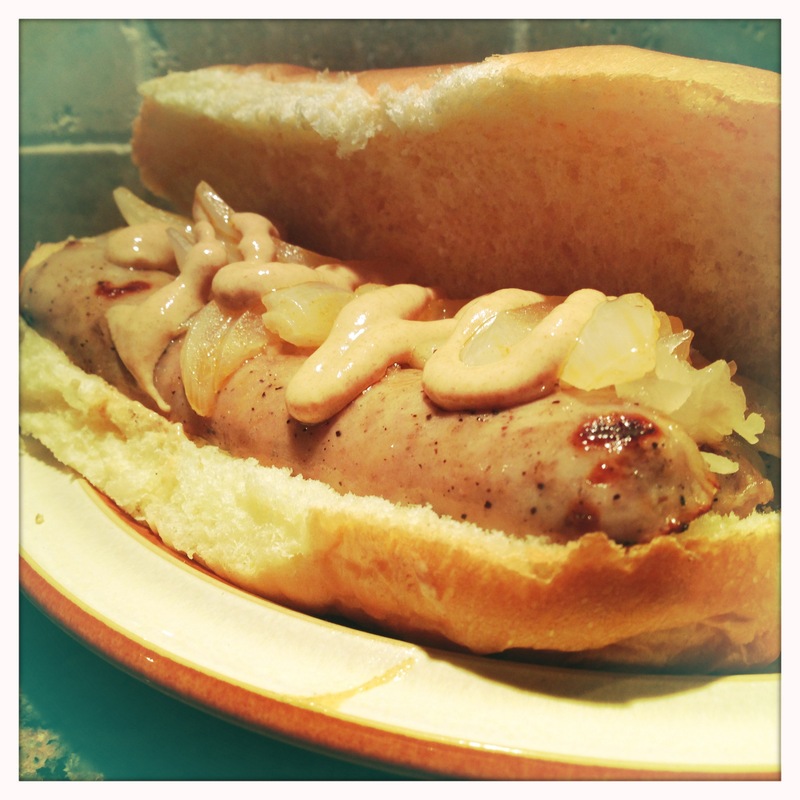 Dusseldorf mustard is a smooth, German style mustard that is great on sausage. It’s somewhere between a regular yellow mustard and a spicy deli mustard. 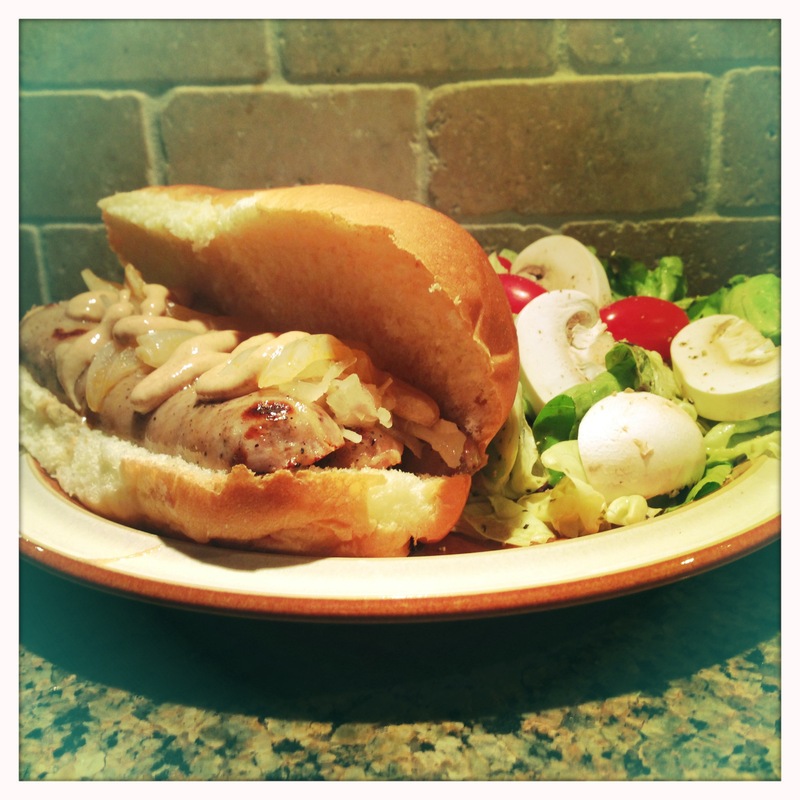 Serve the brats with a light side salad. I used butter lettuce with cherry tomatoes, mushrooms, citrus vinaigrette and a little fresh ground black pepper. It was a nice, light side to pair with the heavier flavors of the brats. This is a great meal that’s easy to adjust for kids tastes (regular mustard or ketchup in place of the dusseldorf mustard, hold the kraut, add pickles, etc). Our little guy loved everything but the kraut. He’s especially into cherry tomatoes these days, and the brats were a hit all around. Enjoy!